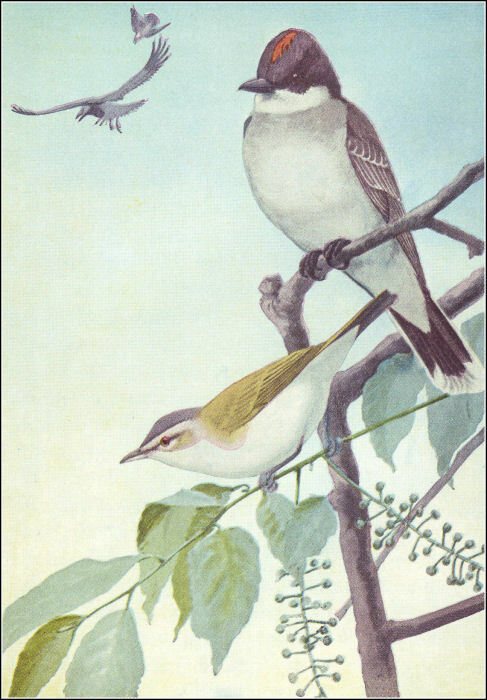 Look in the Old Orchard for a bird with white breast, dark head and back, and with a white tip to his tail. The only Vireo with red eyes. "Of course I am," declared Scrapper. "I—"
Just then he spied Blacky the Crow and dashed out to meet him. Blacky saw him coming and was wise enough to suddenly appear to have no interest whatever in the Old Orchard, turning away towards the Green Meadows instead.